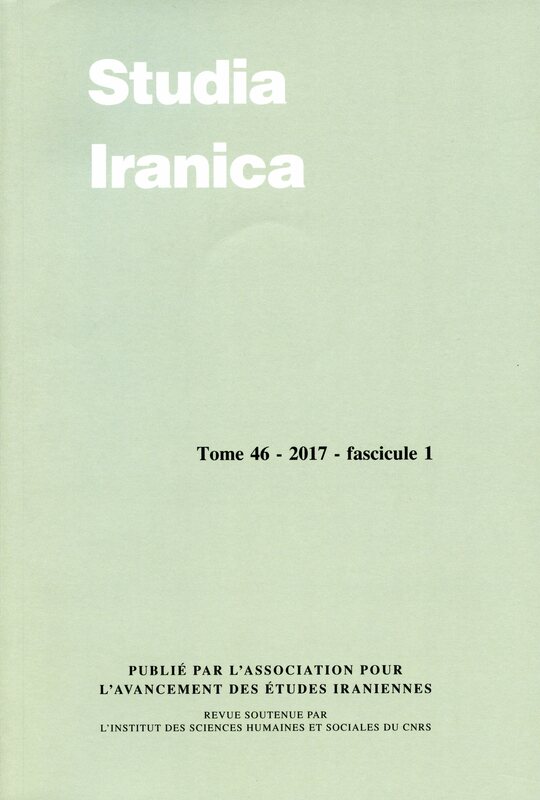 Studia Iranica is a scientific biannual peer-reviewed journal founded in 1972 published by the Association pour l’Avancement des Etudes Iraniennes (AAEI), with the support of the Institute of Humanities and Social Sciences of the National Centre for Scientific Research (CNRS). 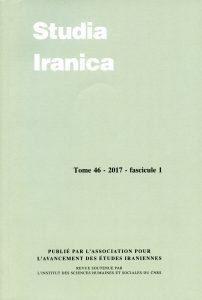 The journal accepts contributions in all thematic fields of research in human sciences in the Iranian world (in broad definition, from the origins to the contemporary times). The geographic space as concerned depends on the periods: Asia Minor, the Iranian Plateau and Afghanistan, Central Asia and Indo-Persian culture in India. Accepted languages are: French, English, German and Italian. Charles-Henri de Fouchécour (professor University de la Sorbonne Nouvelle – Paris 3, retired), Bert G. Fragner (emeritus professor, Institut für Iranistik, Vienne, Autriche), Jean Kellens (emeritus professor, Collège de France), Pierre Lecoq (Director of Studies, EPHE, retired), Nicholas Sims-Williams (emeritus professor, SOAS, London), Michel Tardieu (professor, Collège de France, retired). Denise Aigle (Director of Research, EPHE, retired), Mohammad Ali Amir-Moezzi (Director of Studies, EPHE), Philippe Gignoux (Director of Studies, EPHE, retired), Frantz Grenet (Director of Studies, EPHE / professor, Collège de France), Philip Huyse (Director of Studies, EPHE), Justine Landau (Assistant Professor, Harvard University), Asadullah Souren Melikian-Chirvani (Director of Research, CNRS, retired), Bernard O’Kane (Professor, the American University of Cairo), Francis Richard (library curator, BULAC, retired), Yann Richard (professor, University Sorbonne Nouvelle – Paris 3, retired), Pollet Samvelian (professor, University Sorbonne Nouvelle – Paris 3). Gabrielle van den Berg (University of Leiden), Michele Bernardini (University of Naples), Alberto Cantera (University of Berlin [FU]), Corinne Lefèvre (CNRS), Christoph Werner (University of Marburg). Manuscripts (electronic version) and correspondance should be sent to the direction of the Journal, or to the editorial office by e-mail.